Having a boy horse and a girl horse is interesting, even if it’s a mare (can make baby horses) and a gelding (can’t make baby horses). They still go through most of the motions, especially her and it’s obvious to me she gets quite frustrated when our gelding doesn’t show as much interest as a stallion would. But still they flirt. They nibble eat other, posture and he’s sorta interested. When they’re near the barn I usually tell them to get a room. Well…this week they did that. The night before it happened we were outside roasting marshmallows and I thought I heard banging in the barn. I went to investigate and I swear the horses were looking out of their stall, whistling, as if to say “nothing to see here, move along human”. I looked around and saw nothing. 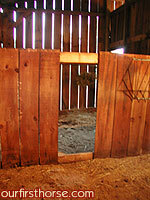 The next morning I get up, walk to the barn and notice troublemaker Valentine’s head poking out of Moonshine’s stall. When I got to the stall I saw her in the background, eyes wide open as if to say “I told him we’d get in trouble…IT WAS ALL HIM!”. That banging was apparently Valentine, our big gelding, kicking the boards between his stall and hers (see pic). Upon closer inspection, I can’t see how he got through there, as he’s wider than the opening. So I let the horses out and we re-installed the boards, this time with screws. I’ve heard horses shouldn’t be in the same stall, even if the stall is pretty large. They’re big, powerful and not graceful in small places. The displaced stall boards were laying on the ground with the nails poking up. Most of the nails were bent over so I imagine they stepped on them. Even with strong screws, if this 16.3 hand gelding wants to visit my mare, a few screws and a 3/4 inch wood slat isn’t going to stop him. I hope this isn’t a trend. Oh, and to be fair I see how she encourages him so my mare isn’t the least bit innocent in this incident.